I hope all my readers are enjoying the summertime. I've been trying to slowly redecorate my apartment, but it's hard on a part time income. Do any of you guys have tips for inexpensive websites or shops for home decor? 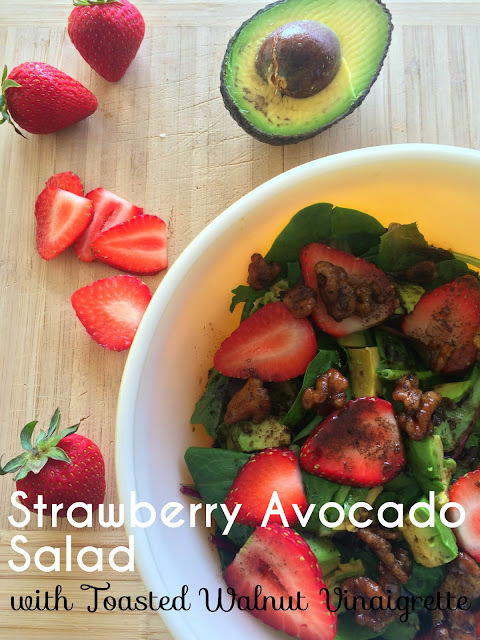 Besides redecorating, I've been eating a lot of salads lately and I stumbled upon this deliciously healthy strawberry avocado salad with the most amazing toasted walnut dressing. I found the original recipe here, but adapted it slightly. It looks so beautiful doesn't it? All those colors mean lots of great nutrients! I highly encourage you to make the dressing. There is something mystical that happens with the coconut oil and balsamic vinegar... you must try it! Heat coconut oil in a nonstick pan over medium heat. Add walnuts and toast for 5 minutes; toss often to prevent burning. Remove pan from heat and add balsamic vinegar, lemon juice, salt and pepper. Allow to cool while you make salad. Pour or spoon dressing over salad and toss. Makes approx. 4 side salads are 2 large.